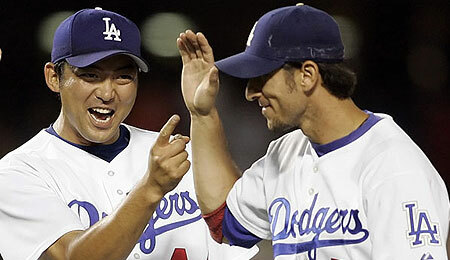 Nomar Garciaparra, right, is just one of the many people who have jumped on the bandwagon of Dodger closer Takashi Saito. As I sit back and take a look at TeamRotoRob in my blogger’s auction league (thanks to Mike Kuchera over at FantasyBaseballExpress.com for the invite) and plan the next piece of my 2007 strategy, a first-half review of former NPB players now playing in MLB seemed fitting. Over the past several years, the concept of trying to build a fantasy team of former NPB players was always lurking in the back of my mind and I couldn’t refuse the opportunity to give it the old college try. Well, the first half results are in and my mix of NPB and MLB players has moved into first place and is more than holding its own. It’s looking like that Brian Roberts-for-Vernon Wells deal I made at the end of last week just might work. Now, back to the task at hand and let’s take a quick look at how these imports have fared. Okay guys, I officially surrender here. After my original review prior to 2006 I was fairly vocal in my opinions of Takashi as being middle-relief material at best and it is time to own up and eat some crow here. I was wrong, damn it! The guy has been lights out and this year he’s stepped it up even further from those great ’06 results. An ERA of 1.47, a 0.71 WHIP, an amazing 47 Ks in 36 2/3 innings and those 23 saves certainly support his being named to his first All-Star team. Wasn’t this the guy the Sox picked up to keep Dice-K company on those long road trips? After giving up a home run to John Buck on the first pitch he threw as a major leaguer, Okajima reeled off a string of 17 consecutive appearances before allowing his next earned run. An ERA of 0.88 and WHIP of 0.78 along with four saves certainly supports his “fan choice” nomination to this year’s Classic. With Dice-K and his extended “family” in Japan throwing their support behind him, this choice was a virtual lock. After a rather slow start, Ichiro has certainly bounced back in a big way. He’s currently batting .365 with 23 SB in 25 attempts. By mid-season 2008 in all probability Ichiro is going to get his 3,000th professional hit (combined NPB/MLB total) and here’s hoping that MLB and Seattle (if he’s still there) reward this accomplishment in a manner deserving of this great player. This former power bat from the Swallows has been a revelation of sorts for me this year. Who would have guessed heading into this season that this is the same guy that struck out nearly 130 times in 2006? Aki has taken his game to a totally different place moving into the lead-off role for the D-Rays. The .297 BA and eight SB works out to a nice plus from a corner infielder. This guy has serious speed, and it is a very real possibility that we could see 20 SB by the end of the year. I think that expectations were just so high for the former Seibu Lion star that his accomplishments to date seem to be regarded by most as almost disappointing. Even with his big-inning struggles earlier this year, Matsuzaka has 10 wins, an ERA of 3.53 and a WHIP of 1.19 to go along with those 119 Ks. I guess my question here is define “disappointing.” In Dice-K’s past six starts has allowed a meager six earned runs in 42 IP to go along with 51 strikeouts. It looks like the Dice-Man might have found himself a very nice groove and is potentially in line for a very solid second half. My hat’s off to Kaz for sticking it out after that rough stint on Broadway. The move to Colorado has proven to be just what the doctor ordered and he is finally starting to deliver on those skills he developed and showed off in the NPB. A .308 BA and a career-high 16 SB in 18 attempts out of the two slot for the Rox certainly helps out us fantasy players nicely. In between bouts with his chronic back, expect more of the same in the second half. Thank goodness for old injuries and metal plates or we’d probably be looking at a significant period of time on the DL for Johjima. Because of a metal plate in his hand from an injury of days gone by, he was saved from a DL stint when getting plunked in that very spot last week. Eight homers and 32 RBI to go along with a very solid .294 BA bodes well for this former Hawk backstop heading into the second half. He was the closer, then the set-up guy, then the closer, and now with Eric Gagne back healthy, Otsuka has returned to the set-up role. He has taken his “demotion” in stride and continues to be very successful in whatever role he is handed. The “stiff right forearm” injury is certainly cause for concern, but with rest hopefully he can avoid a visit to the DL. Just curious here, but does anyone think that both Otsuka and Gagne will be in Texas come year end? “So” be it. He is what he is and does his job very well. A platoon/part-time player, Taguchi is very consistent and, although not a huge help from a fantasy perspective, his value on a day to day basis in the “real game” is very real. The iron-man label is fading quickly as Godzilla spent anther 15 days on the DL this year for a strained hamstring. After reeling off 1,700-plus games without any lost time, the past couple seasons have been a bit trying. He’s certainly contributed this season, with 10 HR and 50 RBI, but the BA has been off a bit and so far this year Matsui has had a tendency to be very streaky. Like most of his teammates, this has been a trying year for Iguchi, to say the least. On a positive note, the past couple weeks have seen a marked improvement and there is no reason to believe at this time that his second half results shouldn’t be more in line with his past couple seasons. This entry was posted on Tuesday, July 10th, 2007 at 12:18 pm	and is filed under BASEBALL. You can follow any responses to this entry through the RSS 2.0 feed. You can leave a response, or trackback from your own site. On reviewing Saito’s NPB career, I’m surprised that anyone was so certain he would be “middle relief material at best”. I never looked at it too closely because nobody else suggested otherwise, but Saito became a radically different pitcher the two years he was used as a reliever. I think everyone should be skeptical of his career 12.05 K/9 rate, but he’s a better pitcher than most people thought. You hit it right on the head with Dice K. Anything short of a few perfect games and bringing about world peace would be considered a failure after listening to all the hype. He’s been a very good pitcher thus far, but he’s not Johahn (yet). I do think you’re being generous with Igawa’s grade though. D+ insinuates that he’s been close to slightly below average. I say he’s failed. This is one that could cost Cashman his job. Thanks for the comments guys. With regards to Saito, I think is important to consisder that at the time the Dodgers acquired him he hadn’t in fact closed since the 2002 season. His K rates were certainly not outstanding and the Dodgers had not one but two relievers in front of him. It took the injury to Gagne and the total ineffectiveness of Baez to even put Saito in a position to get saves. When he started posting numbers that to me seemed so far out of line with his career numbers I just found it very difficult to conjur up anything other than memories of another import, that being Takatsu.